A free bi-weekly e-zine produced since 1999 by The Priority Pro which offers tips and strategies that help you effectively manage your multiple roles and responsibilities. The goal is to support you in achieving success without compromising the quality of your life. Articles may be reprinted with links to this site and full copyright and attribution to the author. Subscribe on our HOME page. Your first issue will arrive within the next two weeks…if not sooner! 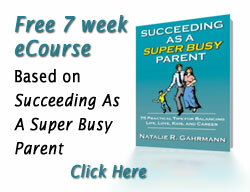 Older ARCHIVES of the Super Busy Parents E-Newsletter , click here. IMPORTANT: We are opposed to spam in all of its forms and place high value on your e-mail privacy. It is our policy to never sell, rent, lease, or share our e-mail list, or any of our subscriber or customer information,with anyone!